The black rhinoceros (Diceros bicornis) is the most well known of the five living rhinoceros species, thanks largely to its highly publicised international conservation drive. Also known as the hook-lipped rhinoceros, it is one of the oldest groups of mammals. Rhinos play an important role in their habitats and in countries like Namibia, black rhinos are an important source of income from ecotourism. The protection of black rhinos creates large blocks of land for conservation purposes, which benefits many other species. Despite conservation and anti-poaching efforts, which has resulted in numbers increasing, the black rhino remains classified as critically endangered on the IUCN (International Union for Conservation of Nature) Red List, with poaching for their horns posing a constant threat to their survival. 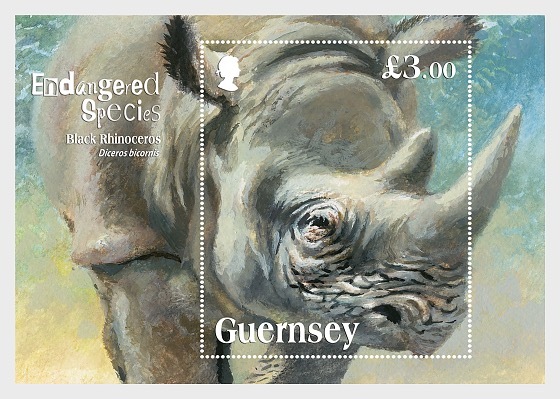 We are delighted to depict the black rhino on our miniature sheet, which is the 12th species to feature as part of our Endangered Species series.